While a release for Chromecast 2 isn’t official even within Google’s walls the team is aiming for an Early 2016 launch, but Chromecast 2 will be welcomed with open arms whenever it arrives. Faster onboard Wi-Fi module would help unleash gaming potential from mobile to TV screens with high frame rates and low latency in tow. An uptick in connection capabilities would also permit even higher-resolution content to be streamed from source to screen — possible even 4K or 60fps 1080p. Chromecast is available to cast local files with Google Cast browser extension, so does Chromecast 2. Let’s focus on ripping and casting Blu-ray movies to Chromecast 2 in the following text. It is able to rip and convert any Blu-rays including latest copy-protected 2D and 3D Blu-ray discs/Blu-ray folders/ISO files to Chromecast 2 playable (H.264) MP4, MKV format with perfect audio and video sync in HD quality. Besides, this Blu-ray converter and rip BD, DVD, ISO to a wide range of formats, like H.265 MP4, M3U8, MOV, M4V, etc and the list goes on. For ripping Blu-ray for Chromecast 2 on Mac OS X (El Capitan), BDMagic for Mac is the alternative. Download the tool and learn a simple guide on ripping Blu-ray for watching on Chromecast 2. 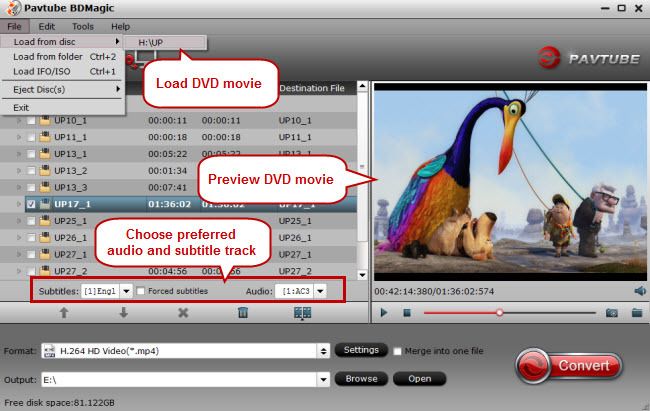 To convert Blu-ray to MP4, MKV for Chromecast 2, just click on the dropdown menu of “Format”, and then choose MKV, H.264 MP4 High Profile Video from Common Video profile list. If you want to keep 1080p resolution as source movie, you can choose HD Video > H.264 HD Video(*.mp4) or MKV HD Video(*.mkv) as output format. Hit the convert button and start ripping Blu-ray to Chromecast 2. When the conversion ends, you will be able to get the result video via tapping the Open button in the main interface. Afterwards, you can stream/cast converted local Blu-ray movies to Chromecast 2 for smooth playback at ease without any incompatible problem. Currently there are two common ways to cast local audio and video files from computer to Chromecast 2. Add Google Cast extension to your Chrome browser (if you haven’t done it). You can get this extension from chrome web store. After successful installation, you can set “Tab casting quality” in “Option” based on your own needs. Type the video file address like “file://d:/hobbit 3.mp4” (without quotation marks) to the address bar in Chrome. Stream Blu-ray to Chromecast 2: When the Blu-ray video is played in Chrome browser, you can stream it to TV via Chromecast 2 using the Google Cast extension. Click the Google Cast extension icon in the Chrome tool bar, and choose the Chromecast 2 device. Then the Blu-ray will be streamed to TV using Chromecast 2 instantly. With the help of these media management apps, you can easily stream movies, music, and photos via the Chromecast 2 to large screen. They organize your scattered content and let you watch the media from tablets, phones, and more..